Twenty days remain until the year 2000 and the activation of the infamous Y2K bug. Suddenly, an incredibly complex, global computer virus begins a countdown to the millennium, shutting down machines for the number of seconds equal to the number of days left until January 1, 2000. Add a mix of torturing terrorists and ancient prophesies, and what you get is Pineiro's (Breakthrough) enticing new novel, almost guaranteed to add more paranoia to the lives of the paranoid, yet, finally, to offer hope as well. Susan Garnett, chief of the FBI's high-tech crimes unit, whose family was recently killed in a hacker-induced car accident, is about to commit suicide. She is yanked back into the thick of life by the virus, which turns out to be linked to an extraterrestrial/Mayan mystery. Taking a cosmic approach to setting, the novel's omniscient narrator puts the Y2K countdown in perspective before zooming in on Susan, the expert Mayan archeologist who helps her, a SETI team whose search for alien life may be over and the terrorists who want to control the virus for their own ends. There is little chance of readers getting lost in the science of the book, as every aspect of it is explained, often using one character's ignorance to allow another to explain something. Paced at a steady rhythm, the narrative oscillates between the technical and the poetic. The proximity of the future predicted may shorten the shelf life of this work, but the paranoia and superstition surrounding the advent of Y2K should give it a vigorous, if brief, run. Agent, Matt Bialer at William Morris. 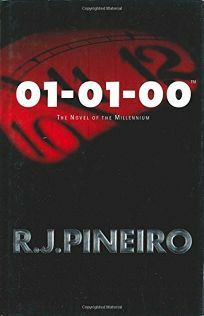 (June) FYI: The marketing campaign for Pineiro's novel will tie in with the licensing program for Ken Walker's trademarked ""01-01-00.""